Join us on February 3rd (9AM - 2 PM) as we gather with Grace PCA and Covenant OPC for a Men&apos;s Conference to help you fight the good fight in 2018. 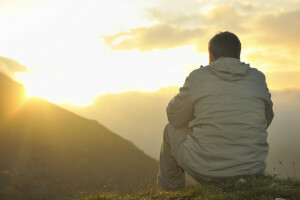 Each topic will be relevant to men of our time and will be followed by a time of discussion and prayer. All men, high-school age and above are welcome to attend, and I would like to see all of the men in our congregation at this event, as I think it is both timely and important. The event will be located at The Lodge at Grace PCA (805 Blossom Rd. 14610) and will include donuts and coffee for breakfast and a catered lunch, and the cost will be $25 per person. Register at this link. The Bulletin for this week is now available on the website and is attached to this e-mail. See you tomorrow!! (6:30 PM) - We will meet at 6:30 PM at Penfield Place, located at 1700 Penfield Rd, Penfield NY 14526. We will sing through the halls as a group. (7:15 PM) - Then, we will drive to Aaron Manor, located at 100 St. Camillus Way, Fairport, NY 14450 and sing for the residents in a common area. (7:45 PM) - Finally, we will drive to DePaul Parkside which is two doors down from our church. We will bring candy canes, sing to the group in a designated room and pass out some Candy Canes. Good evening, RRPC! The bulletin for this coming Lord&apos;s Day is attached to this e-mail. This is an exciting Sunday during which we will have Helen&apos;s baptism and our Sunday School presentations! The Presbytery happy to announce the Winter Youth Retreat at Oswego RP Church in Oswego, NY on January 12-14, 2018 for 7th-12th grade youth! Aaron Goerner, Pastor at Christ RP Church in Floyd, NY, has agreed to be the speaker and will be presenting three messages on Living in Babylon. The cost will be $30 per youth, which will include lodging and meals. Payment can be given at the retreat. Please register online by Jan. 4, 2018 to avoid a late fee of $10. Online registration can be found here: https://rpmissions.wufoo.com/forms/z8wtrc61h2zu03/ Once you register you will receive a confirmation email with packing lists, arrival times, directions, etc. You have to fill out a separate online registration form for each child attending. Time: Meet @ the Church at 7:30. Come bundled up and with your voices prepped. There will be a route prepped for us that will have us end back at the church (walking or driving is TBD). If you are willing to bring some snacks or cider that we can enjoy after singing, that would be a great blessing! 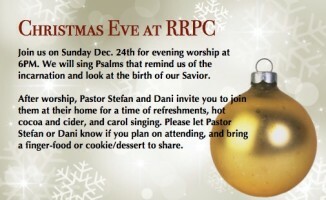 Join us on Sunday Dec. 24th for evening worship at 6PM. We will sing Psalms that remind us of the incarnation and look at the birth of our Savior. After worship, Pastor Stefan and Dani invite you to join them at their home for a time of refreshments, hot cocoa and cider, and carol singing. Please let Pastor Stefan or Dani know if you plan on attending, and bring a finger-food or cookie/dessert to share.